Bread and butter is comfort food for a reason; the mix of starch and fat triggers the pleasure centers of your brain, making it a "feel-good" snack. Bread and butter can provide the calories you need to add pounds to your frame, and it can definitely fit into a weight-gain diet, but it shouldn't make up the majority of your diet. Eat bread and butter in moderation, along with plenty of sources of protein, for the healthiest weight gain. When you're trying to gain weight, you need to take in more calories -- from food and drink -- than you burn daily. That doesn't mean you need thousands of extra calories, though; 250 to 500 extra per day is fine. That will allow you to gain weight at a safe rate, which is 0.5 to 1 pound each week. A single serving of bread and butter could supply the extra calories you need for weight gain, if you eat it in addition to your regular diet. Butter alone contains 100 calories per tablespoon, and bread supplies calories as well. Two slices of whole-wheat bread topped with a tablespoon of butter contain around 260 calories, while butter on top of two 1-ounce slices of French or sourdough bread supplies about 250 calories. Eat either of these snacks on top of your regular meal plan, and you'll hit your target for a 0.5-pound weekly weight gain. Bread and butter come loaded with carbs in the form of starch, along with fat. A serving of French or sourdough bread and butter supplies 30 grams of carbs and 12 grams of fat, for example, while a 2-slice serving of whole-wheat bread with butter contains 28 grams of carbohydrates and 12 grams of fat. Both carbohydrates and fats can help you in your weight gain efforts. Your body breaks starch down into sugar, then re-assembles that sugar into glycogen in your muscle tissue. Glycogen helps fuel your muscles, so you can work hard during the strength-training sessions you need to do to gain muscle. Fat also serves as a concentrated source of energy. Your body can also burn fat for fuel, so including a bit of fat -- including the fat from butter -- in your diet can keep you energized. Where bread and butter falls short is in protein content. Getting enough protein is especially important when you're gaining weight, since you'll need more amino acids than usual. In fact, people looking to bulk up need twice the amount of protein as a sedentary person, and they should increase their intake from 0.4 grams per pound of body weight to 0.8 grams per pound. A serving of butter on sourdough or French bread has just 6 grams of protein, while a serving of butter on whole-wheat bread has 8 grams per serving. Because that protein comes from the grains in the bread, which is an "incomplete" protein, it's also missing some of the amino acids you need for muscle growth. That doesn't mean you need to avoid bread and butter; just make sure you're also eating sources of high-quality protein, like lean meats and fish, beans, lentils, eggs and dairy. Pair your bread and butter with protein sources to make your snack more weight gain friendly. Turn your bread and butter into an open-faced sandwich by adding sliced tomato, a lettuce leaf and a few ounces of sliced grilled chicken breast. Serve your bread and butter on the side of a grilled salmon entree, with a heaping serving of steamed veggies for extra nutritional value. Eat bread and butter along with a protein-packed turkey or quinoa chilli -- topped with a dollop of plain nonfat Greek yogurt as a higher-protein alternative to sour cream -- or serve bread and butter on the side of a hearty bean or lentil soup to get the amino acids you need for muscle growth. 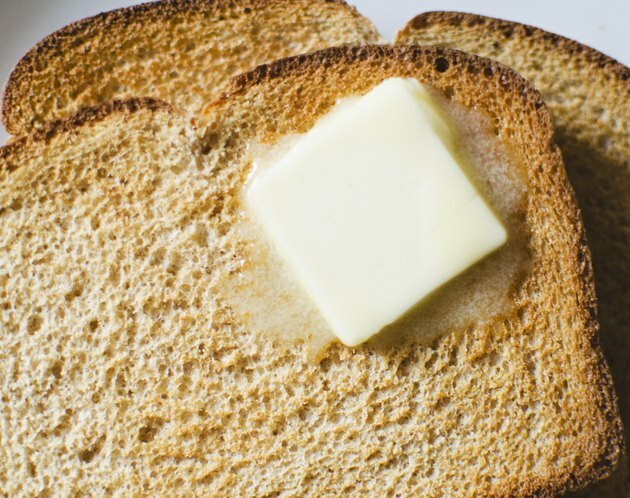 Is Eating Bread with Only Butter on It Healthy?